You’re near the end of a beautiful trail in the evening twilight, with the clouds slowly turning pink on the horizon and the mountains casting reflections onto a glassy lake just ahead. The only thing that might make the moment better is a cold beverage in your hand, and thanks to the craft beer explosion of recent years, you have one from your favorite local brewery tucked away in your pack. As you crack it open and take a sip, you notice a family of mountain goats among the craggy rocks, and a fabulous sunset fills the sky. Okay, so most hikes don’t end this way—they end with bugs, exhaustion, and tired legs. But even less-than-stellar excursions are better with beer, and fortunately for Utahns, we have a growing selection to choose from. After testing a few combinations, I’ve come up with the perfect beer to pair with some classic summer activities. Where to Go: Lake Blanche. This classic hike or overnight trip in the Wasatch Mountains is 6 miles roundtrip and ends at a stunning alpine lake perched in a glacial bowl. Start at the Mill B Trailhead in Big Cottonwood Canyon and be prepared to climb! Where to Buy: Best bet is Epic’s Tapless Taproom, 825 South State Street in Salt Lake City. When you’re backpacking into the wilderness on a sunny summer afternoon, visions of cold drinks will probably dance through your head at some point. And Epic has made a perfect cold drink to enjoy at the end of your backpacking or hiking excursion. 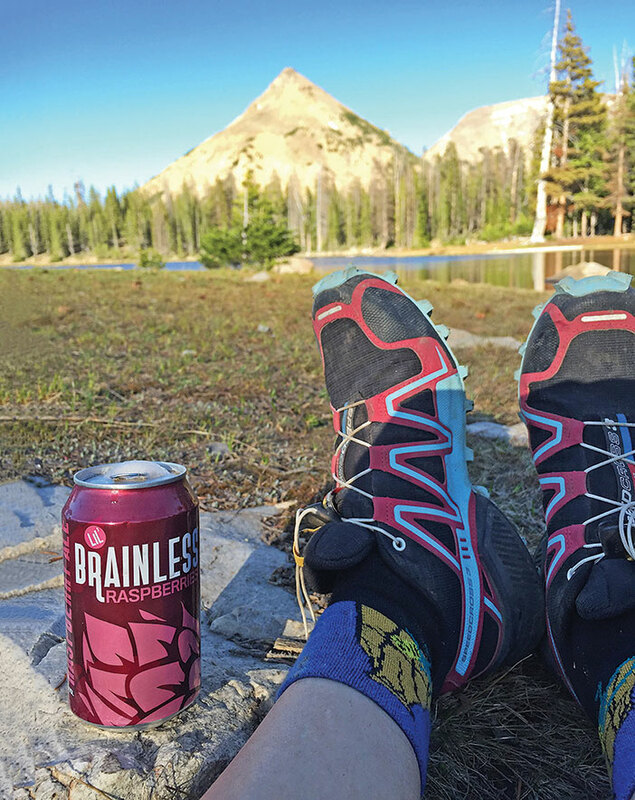 Lil’ Brainless on Raspberries is the lighter cousin of Brainless on Raspberries, one of the company’s flagship brews. It’s fruity but not overly so, sweet but not cloying, and just tart enough to refresh your parched palate. And it’s canned, leaving less weight for you to pack out! Where to Go: Bonneville Shoreline Trail. Choose your own distance as this trail stretches for approximately 13.5 miles in Salt Lake City proper. One of my favorite places to start is at the Utah Museum of Natural History. Head south for gentle inclines and great views of the Wasatch Mountains, or north for bigger climbs and a trail that takes you all the way to City Creek Canyon (and beyond). Where to Buy: Harmons City Creek or Harmons Brickyard. Many of us don’t think of drinking anything but water at the end of a long run, but researchers in Spain found that having a beer after a tough workout may rehydrate you better than water while replenishing lost calories! 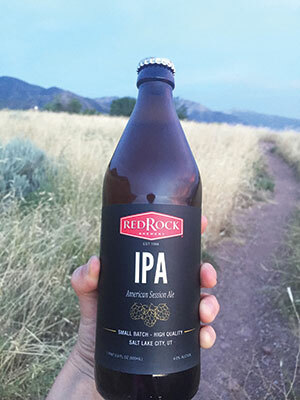 If you’re going to drink after your next run, try something light and flavorful, like Red Rock’s Session IPA. It’s only 4%, fitting the bill for a session beer, but it packs plenty of taste with a hoppy, somewhat bitter start and a well-balanced, malty finish. Where to Go: Take a trip on the Green River and journey through deep canyons for spectacular views (try a multi-day trip for the fullest river experience). Or take a guided trip down Westwater Canyon on the Colorado River, which offers class III and IV rated whitewater and close proximity to Moab. Where to Buy: State-run Utah liquor stores. After a few days of scorching temperatures, getting on the water sounds extra appealing. While some tour companies won’t let you bring a beer on a guided rafting trip, there’s no rule against cracking one open when you get back to shore! Or if you and your crew guide your own trip, canned beer is welcome to come along for the ride. 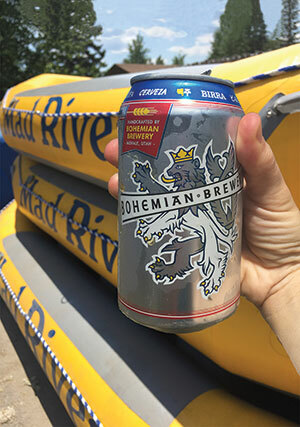 Bohemian Brewing makes a delicious altbier, or German-style brown ale, that tastes great after a day battling the rapids. It’s refreshing, but not too filling, with toasty caramel flavors that hit the spot. Comes in a can so it’s easy to pack out! Where to Go: Millcreek Canyon. Numerous picnic sites and a quick drive from Salt Lake City make this the perfect after-work retreat for s’more roasting. Where to Buy: This beer hasn’t made it to cans quite yet, but you can pick up a growler at their Park City Tap Room at 2720 Rasmussen Road, Suite A1 before heading out on your next camping adventure. Not all summer activities are high-octane—one of the season’s simple pleasures is sitting around a campfire and roasting a marshmallow for a toasty s’more. 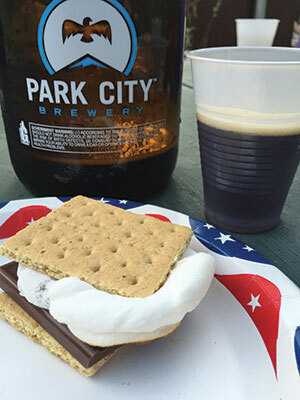 While not every beer tastes great with dessert, Park City Brewing’s new brown ale hits the spot. It’s roasty with flavors of chocolate and coffee that perfectly complement the sweetness of the s’more, yet it’s light enough not to overpower your perfectly crafted marshmallow creation. Where to Go: Wasatch Crest. Hit this trail for miles of high-elevation riding and stunning scenery, or for something easier on your legs, visit Deer Valley or Snowbird and ride the lifts up for fun multitude of downhill-only trails. Where to Buy: Many local grocery stores, including: Harmons, Smiths, Trader Joes, and Whole Foods. Bikes and beer go together like peanut butter and jelly. After a long road or mountain ride, cracking a cold one always hits the spot. 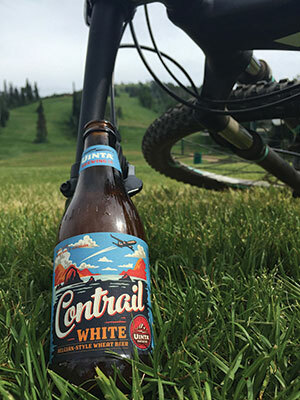 There are lots of good canned and bottled options out there, but Uinta has made an especially tasty new Belgian wheat beer (or witbier) that’s perfect for your summer rides. It’s brewed with orange peel and coriander, which gives it a unique dimension in the world of session wheat beers. Contrail has a nice grainy backbone and a zesty, citrusy finish. Sarah Shebek is a former Midwesterner turned Utah transplant of two years. When she’s not at her day job, Sarah loves hiking trails near and far, camping whenever possible, and mountain biking. She’s also a fan of craft beer, iPhoneography, desert sunsets, mountain lakes, hatchbacks, Tevas, french fries, and her Maltese, Percy.